In July 2016, Shinka Management will celebrate 10 years of the Lean Japan Tour by inviting past participants of the Lean Japan Tour to the beautiful southern island of Kyushu. A completely new selection of company visits has been arranged in the prefectures of Fukuoka, Oita and Kumamoto. The tour will be held on Sunday 17th through Saturday 23rd of July, and will include kaizen seminars and visits to factories for meetings with senior management. 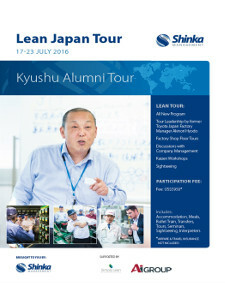 The July 2016 tour is open to all past participants of the Lean Japan Tour.